Store, transport, and protect up to two 250-style moving head lights with the black G-Tour Flight Case from Gator Cases. The interior features two foam-padded, fabric lined compartments. Users will appreciate the durable 3/8" plywood construction, metal ball ends and trim, and the removable lid with latches (two locking). Two-person carries are made easier with the recessed spring-loaded handles located on each side. Roll the case with the large swivel casters (two locking). 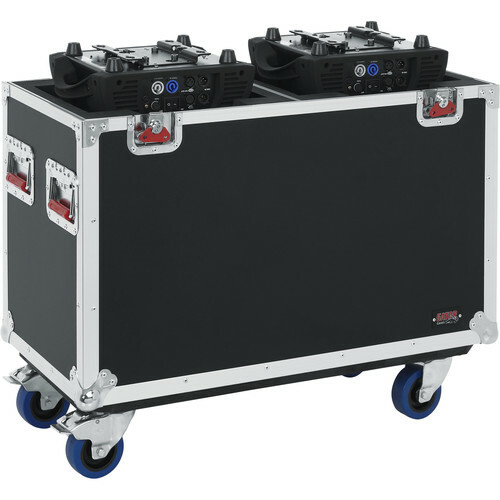 Box Dimensions (LxWxH) 35.0 x 29.0 x 19.0"
G-Tour Flight Case for Two 250-Style Moving Head Lights (Black) is rated 3.0 out of 5 by 1. Rated 3 out of 5 by Brett from Not the right case for the Rogue 3 Spot B&H has this listed as a case option for the Rogue 3 Spot from Chauvet. The light is too wide and too tall to fit correctly in this case. Why suggest this product if the light does not fit in the case?!?!? Did anyone at B&H confirm with Gator or Chauvet that is would be a functioning solution for these lights?